With over one million residents, Cologne is Germany’s oldest major city. Past Roman influences are still seen today between the architecture of City Hall and the Cathedral, the Rhine River, and Rudolfplatz. Visitors who venture below ground find remnants of ancient Rome: sections of crumbling walls, tarnished coins, and intricately decorative mosaics. One of the most stunning of these mosaics can be viewed and admired in the Romano-Germanic Museum. For centuries, the Cologne Cathedral has been the heart and hallmark of this city on the Rhine. The cathedral has and still is a major attraction for pilgrims, believers, tourists, and architecture lovers from all over the globe. With more than six million visitors per year, the cathedral is the most frequently visited attraction in all of Germany. At 157.38 meters high, the Cathedral, which is dedicated to St. Peter, is the second-tallest church in Europe and the third-tallest in the world. The imposing Cathedral houses the golden Shrine of the Three Kings, which became one of the most important pilgrimage sites of the Middle Ages. Since 2007, an additional point of attraction at the Cathedral has been the stained-glass window created by the world-famous Cologne artist Gerhard Richter – a shimmering play of light shining through colored glass squares. Cologne Cathedral was listed as a UNESCO World Heritage Site in 1996, and is not only Cologne’s but also Germany’s most important tourist attraction. Cologne’s ring of twelve large Romanesque churches is another major highlight of ecclesiastic architecture. This ring of churches has shaped Cologne’s cityscape since the 12th century. Although the churches were destroyed in World War II, they were subsequently rebuilt, and since 1985 Colonia Romanica has once again shone in its former glory. During the Middle Ages, Cologne had one of the most significant Jewish quarters in Europe, as well as the oldest synagogue north of the Alps. The city is planning to honor its Jewish cultural heritage through its planned Archaeological Zone with an integrated Jewish Museum, which will be located on and underneath the square in front of Cologne’s City Hall. This is one of the most spectacular cultural projects ever undertaken by Cologne: on an area of approximately 7,000 square meters, visitors will be able to see the original locations of monuments from two millennia. Ever since its construction in 1899, the neo-Romanesque synagogue in the Roonstraße has been the biggest religious and cultural center of the Jewish communities in Cologne. It was burned down during the Reichspogromnacht and rebuilt between 1957 and 1959. Cologne has many places of worship of other faiths as well. The large mosque currently under construction in the city’s Ehrenfeld district will serve as a center for the Muslim community. The building’s design is characterized by a sophisticated interplay between concrete, glass, and wood, as well as a transparent dome flanked by two delicate 55-meter-high minarets. The Museum Schnütgen in the city center of Cologne invites visitors to enter the fascinating world of the Middle Ages. In one of Cologne’s oldest church buildings, the Romanesque church of St. Cecilia, the impressively staged permanent collection of medieval art reveals its full splendor. Kolumba is the art museum of the archdiocese of Cologne. Originally founded as the Diocesan Museum of Cologne in 1853, it was renamed Kolumba in 2004 after its present location on the site of the former church of St. Columba. Here visitors can experience 2,000 years of Western culture under one roof, with works of art dating from late antiquity to the present. The architecture of the museum is an interplay of the ruins of the Late Gothic church of St. Columba, destroyed in the Second World War; the “Madonna in the Ruins” chapel (1950); the unique archaeological excavation on the site (1973–1976); and the new construction designed by the Swiss architect Peter Zumthor. In November of 2013, The Art Critics Association named Kolumba “Museum of the Year”. In the cellar of the sacristy, dating back to the Middle Ages, the Cathedral Treasury presents a rich store of Christian church treasures dating from the fourth century A.D. to the present. It comprises artifacts created from gold, silver, bronze, and ivory, including reliquaries, liturgical implements and textiles, archbishops’ insignia, medieval sculptures, and other items discovered in Frankish graves. The Rautenstrauch-Joest Museum – Cultures of the World, which received the Council of Europe Museum Prize in 2012, offers multifaceted insights into new and old worlds, as well as strange and familiar cultures. In the Religion section, the museum presents the major religions – Buddhism, Christianity, Hinduism, Islam, and Judaism – and their offshoots. With its splendid sculptures from Asia, the museum focuses on the images of deities in Buddhism and Hinduism. 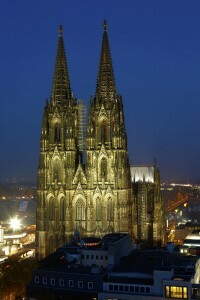 The Cologne Tourist Board has designed two guided city tours on the theme of “Holy Cologne”. “On the trail of ancient bones” focuses on relics in Cologne Cathedral and the churches of St. Andrew and St. Ursula. The “Gates of Heaven” guided tour is devoted to the theme of doors and portals that serve as entrances into a church. In many cases, such doors and portals are the products of exquisite craftsmanship. 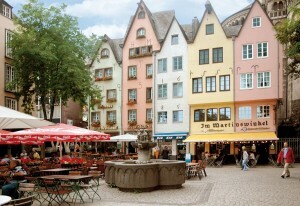 The Cologne Tourist Board also offers a travel package for a theme-related stay in the cathedral city. The theme of “Holy Cologne” can be approached on many levels. It encompasses not only the city as a center of Catholicism and a city of churches, but also, and even more importantly, Cologne as a cosmopolitan city with many religious communities and a multifaceted culture. The open and tolerant mentality of Cologne’s residents is expressed in a song by the popular kölsch band Bläck Fööss: “I’m a Greek, a Turk, a Jew, a Moslem, and a Buddhist – All of us are just people, equal in the eyes of God.” It is on site in this welcoming city when visitors begin to feel this mentality and appreciate why Cologne is more than just a city on the Rhine – why it is a delightful city with a warm and infectious way of life, and definitely worth a visit. To learn more about Cologne and the Cologne Tourist Board, visit them online at www.cologne-tourism.com.